license equivalent per transaction, these deals alone would result in “underreporting” license revenue by $70mn--$140mn, or 2-4% license growth. As Oracle’s Cloud business continues to ramp, investors will have to start measuring new ARR and growth to more accurately credit Oracle for the gradual business model shift. Oracle’s Cloud subscription is already a $1B business and expected to grow at ~25% in FY14. Oracle may (or may not) manage this "gradual business model shift" over time, and the law of large numbers makes growth rate comparisons to smaller vendors somewhat beside the point. Workday's 2013 revenue was only 273 million (with a loss of 119 million) and while salsforce.com is over 3 billion in revenue, the company is still not profitable (on a GAAP basis). The big news last week revolved around Oracle's back-to-back announcements with salesforce.com and Microsoft. The salesforce.com-Oracle alliance has SFDC adopting Oracle technology for its cloud offerings, as well as replacing Workday applications with Oracle Fusion applications for HCM and Financials. The Microsoft-Oracle enterprise partnership extends the Oracle stack to Microsoft Azure, the Microsoft cloud platform. (Microsoft apparently will continue to run SAP). Both of these alliances bring historically fierce competitors together, and while press releases don't run (or integrate) software, there is a lot more here than promises. Oracle announced similar agreements with Amazon and NetSuite. Announced last year at Oracle OpenWorld, Oracle's new 12c release of its database is the driver of these new alliances and partnerships. (The c in 12c stands for cloud). Released this week, this version of Oracle's database promises to dramatically improve the administration of public, private or hybrid clouds. This was a very good week for Oracle. 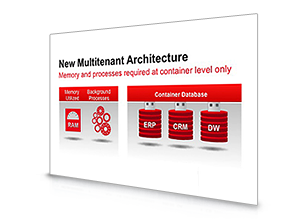 And for Oracle customers and partners.